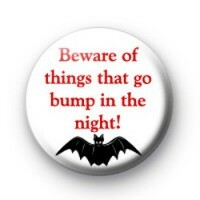 This button badge has Red creepy writing reminding you to Beware of things that go bump in the night! Along with a creepy black bat. Don't get spooked this Halloween!